On arrival in Pakistan, former prime minister Nawaz Sharif and his daughter Maryam are facing arrest in a case relating to the purchase of high-end properties in London. 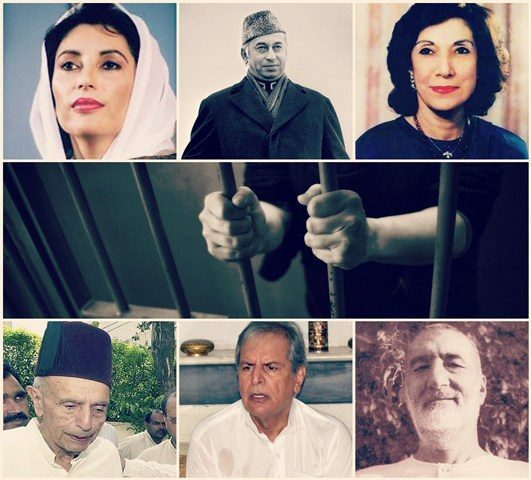 We thought it would be interesting to look back at all the major political figures in Pakistan who have spent time behind bars. Nationalist leader Ghaffar Khan was arrested in 1948 and jailed for seven years. In 1956, he was arrested for protesting against the establishment of ‘One Unit’ in West Pakistan. He was kept in prison by the Ayub Khan’s regime until 1964. Nawabzada Nasrullah Khan was detained time and again for being very vocal against military rulers. Zia-ul-Haq, who ruled for a decade, put Nawabzada under house arrest for nearly five years. During Musharraf’s government, he headed that 16-party Alliance for the Restoration of Democracy (ARD). Nawabzada was briefly arrested for announcing to hold a rally in Lahore. PPP founder Zulfikar Ali Bhutto was detained by military rulers for nearly two years, until his execution. Bhutto was first detained by the then army chief General Yahya Khan in 1971 for criticising his mishandling of Bangladesh situation. Bhutto was imprisoned at the Adiala Jail (Rawalpindi) for several weeks until Yahya resigned and transferred powers to Bhutto. In July 1977, Bhutto and his cabinet members were detained for a month when General Zia-ul-Haq staged a coup. In the murder case of Ahmed Raza Kasuri (1974), Bhutto spent more than a year and a half in jail until his execution on April 4, 1979 at Central Jail Rawalpindi. Zulfikar Ali Bhutto’s wife, Begum Nusrat Bhutto, become a symbol of resistance to the military dictatorship of General Zia-ul-Haq after taking over as head of the PPP. She was frequently put under house arrests and detentions during 1970s and 1980s. The Zia regime did not allow her to attend her husband’s funeral after he was executed. Benazir Bhutto has also been behind bars. In 1981, she was imprisoned in Sukkur Jail under harsh conditions for six months. Later, she was shifted to Karachi Central Jail where she remained imprisoned for the next six months. Benazir Bhutto was also placed under house arrest in Larkana for 11 months. In 1985, Benazir was kept under house arrest in Karachi for four months, until her return to France. While taking part in pro-democracy rallies during the Zia regime in 1986, Benazir was again detained for several weeks in Landhi Jail. Asif Zardari has spent 11 years in jail on charges ranging from corruption to murder and money laundering. He was first jailed from 1990 to 1993 and then from 1996 to 2004. After Pervez Musharraf’s 1999 coup, Nawaz Sharif was convicted of treason and sentenced to life imprisonment by a military court. But at the request of the Saudi monarch King Abdullah Bin Abdul Aziz, Nawaz Sharif and Shehbaz Sharif were released from prison after a year and exiled to Saudi Arabia in December 2000. They were kept in Attock, Landhi, and Adiala jails. After Pervez Musharraf imposed emergency in Nov 2007, Imran Khan, the then opposition politician, remained in week-long custody. Khan was arrested after trying to take charge of a student protest in Lahore against the state of emergency. He was detained in the Dera Ghazi Khan jail. He was demanding the reinstatement of supreme court judges fired by Musharraf. Senior politician Javed Hashmi was detained for about four years – from 2003 to 2007 – after he was convicted on treason charges for criticizing the army. MQM founder Altaf Hussain was arrested at least three times during his political career since 1979. He was sent to jail for nine months in 1979, four months in 1986 and five months in 1987 in connection with different cases.